Adonis Stevenson and Oleksandr Gvozdyk presser. Photo credit: Amanda Westcott/Showtime. 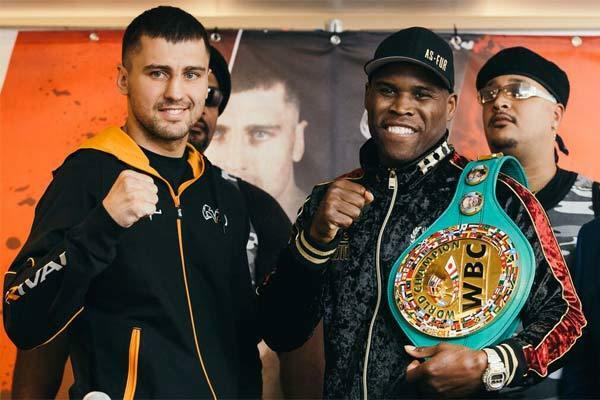 Adonis ‘Superman’ Stevenson 29-1-1 (24) has shrugged off his underdog status ahead of the 10th defence of his WBC light heavyweight title against Oleksandr ‘The Nail’ Gvozdyk 15-0 (12) at the Centre Videotron in Quebec City, Canada this Saturday night. The 41-year-old southpaw, who has stopped six world title challengers in his five-year reign, is looking forward to putting his power on display again this weekend. “I’m looking for the knockout. That’s just my mentality and the way that I train. Sugar [Hill Steward] trains me to think that way but I can also go 12 rounds, it’s not a problem,” said Stevenson, who claimed the green belt with a first round KO of Chad Dawson in 2013. “I know that if he makes a mistake, I’m going to catch him. He only has to slip-up once in 12 rounds. One mistake, one punch. That’s all it’s going to take. I’m ready. I know I can punch and it’s 12 rounds. I just need one punch. Just one. I’m going to catch him and the night will be over. Oddsmakers have Gvozdyk the favourite at -180 while Stevenson is the underdog at +150. Gvozdyk, who picked up the interim WBC 175-pound belt with a 12-round points decision over little-known Frenchman Mehdi Amar in March, will be having his first fight under new trainer Teddy Atlas. “I’m not worried about what the bookmakers say. It doesn’t mean anything that they think I am the favourite,” said the 31-year-old Ukrainian, who scored a breakthrough win over Roy Jones Jr-trained contender Isaac Chilemba two years ago. “I try to stay focused on the things that I need to be focused on, not what the bookmakers think. Gvozdyk is refusing to admit his 10-year age advantage over Stevenson will have any impact on the fight. “People always ask about Stevenson’s age but George Foreman and Bernard Hopkins performed at a high level when they were 50-years-old,” Gvozdyk said.